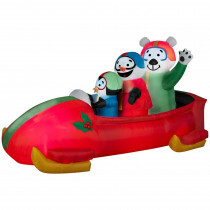 This outdoor inflatable scene features a bobsled team of cute holiday characters. It's sure to get all your neighbors and holiday guests into the Christmas spirit. Airblown inflatables make a wonderful addition to your outdoor Christmas decor, providing maximum impact with minimum effort. This lighted, self-inflating scene comes with everything you need for set-up and installation, including lawn stakes and tethers.